The audio version of Rare Form (Descended of Dragons, Book 1) is up for pre-order on Amazon and Barnes & Noble. The audio book releases September 21st. 1. Tantor Media's distribution will put my books into public libraries, which is very important to me as a fervent library supporter and a voracious library patron. 2. The talented Dara Rosenberg is narrating the series. Dara is an accomplished voice-over artist recognized nationally for her work in audiobooks and commercials. She has narrated over 140 audiobooks and is the voice of dozens of national television and radio commercials. You can hear Dara's voice each day as a daily news reader for Time Magazine, SpeakPage, and Wibbitz, where she reads for the Huffington Post, CNN, and Reuters. 3. I'm excited about this publishing contract with Tantor Media, who has published many of the audio books you know and love. 4. Audio books make this fun and exciting series available to a whole new set of book lovers. If you love to listen to books on Audible or CD, stay tuned! Rare Form will be available in less than one week, and Origin Exposed, (Book 2) is in production now! Signing a contract to produce audiobooks for three novels in the Descended of Dragons series. I am so happy to finally share this news with you. Last night, I signed a contract to publish audiobooks of all three novels in the Descended of Dragons series! There will be more details in the months to come, but I couldn't keep this in any longer. I've signed with a long-time and respected publisher, who has produced audiobooks for many of my own favorite authors and best sellers. Now the process begins to find a great narrator and get these audiobooks out there. Eep! I love listening to audiobooks myself, so this was important to me. Also important was getting them into libraries, which this deal allows me to do. 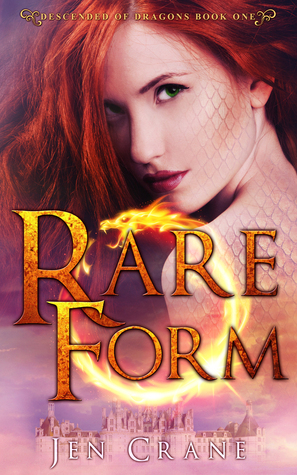 Would you like to have a print copy of Rare Form (Descended of Dragons, Book 1)? Maybe you've read the ebook but, like me, still love the feel and smell of a real paper book. Or, maybe you loved the series and want to give a copy to a friend or coworker. If you'd like to win a print copy of Rare Form, sign up for my Goodreads Giveaway now through July 13th.